Chamomile tea, also known as manzanilla tea, is an herbal tea made from a plant in the Asteraceae family. It usually comes from one of two varieties of the chamomile plant—German chamomile and Roman chamomile—and has numerous health benefits due to the presence of flavonoids. Chamomile tea benefits include improving sleep, reducing anxiety, controlling blood sugar, and boosting cardiovascular health. Ahead, we will cover the benefits of chamomile tea, as well as how to make it and how to use it, to reap all the health benefits that this tea has to offer. What does chamomile tea do and what is it good for? Chamomile tea health benefits are numerous. Below are the most common health benefits of chamomile tea. Does chamomile tea help with sleep? Chamomile tea contains an antioxidant flavonoid called apigenin. Apigenin is the component in chamomile tea that provides its sedative-like quality. It can help you get to sleep if you suffer from sleep disorders like insomnia. Anxiety and depression are fairly common afflictions these days, and one of the benefits of chamomile tea is that it may help you deal with these issues. In the case of anxiety and depression, the same component in the tea that helps you sleep can help calm your anxiety and sway your depression. As mentioned, the flavonoid apigenin in chamomile tea has a relaxing, sedating quality that can help you sleep. This same flavonoid can also take the edge off anxiety and depression, making it easier to deal with them. Although chamomile tea may help with anxiety and depression, it is not meant as a replacement for anxiety and depression medication. Chamomile tea has long been used all over the world as a digestive aid, especially for those who often have digestive issues. As it turns out, there is an actual scientific reason for it. Chamomile tea contains a compound called bisabolol. Bisabolol is a compound that acts as anti-irritant, anti-inflammatory, and anti-microbial properties. These properties can help soothe the stomach as well as relax the muscle lining of the digestive tract. This can help ease digestion and the passage of food through the intestinal tract. Chamomile tea also contains a compound called anodyne. Anodyne can act as an anti-spasmodic agent. It is very useful in curtailing stomach cramping, constipation, and many symptoms of irritable bowel syndrome. Cancer is the ever-present boogeyman of disease. Many people are worried that they will get some form of cancer and will do anything to prevent it. Chamomile tea may be able to help with cancer prevention. The apigenin contained within chamomile tea may also be able to prevent the formation of certain types of cancer. Apigenin exhibits many antioxidant properties as well as the anti-inflammatory properties we mentioned in previous sections. These properties can help get rid of free radicals that may cause cancer, as well as possibly inhibit the growth of cancer cells. Specifically, apigenin may help prevent prostate, breast, skin, and ovarian cancer. Chamomile tea may be able to help control blood sugar levels. Numerous studies have shown that the antioxidants in chamomile tea can help lower blood sugar levels in people suffering from diabetes by preventing the progress of hyperglycemia and diabetic complications. Chamomile tea can help reduce HbA1c and serum insulin levels. Chamomile tea can also inhibit the enzymes that can cause diabetic complications like diabetic neuropathy (nerve damage), cataracts, retinopathy (retinal damage of the eye), and nephropathy (kidney damage). The research into the connections between cardiovascular health and chamomile tea is currently limited at best. However, there are some potentially useful components to chamomile tea that may help with the cardiovascular system. Currently, research seems to point to antioxidants being able to help cardiovascular health, especially in relation to oxidative stress and blood pressure. And, both of these are important aspects of your heart’s processes and health. As apigenin is a fairly powerful flavonoid and antioxidant, chamomile tea may be able to help with heart health as well. Chamomile tea may also help boost your immune system, allowing you to fight off colds and bacteria better. Drinking chamomile tea on a regular basis can help raise the body’s level of hippurate. Hippurate helps your immune system kick into high gear when fighting an infection. Drinking chamomile tea may also help prevent colds and infections as the hippurate levels may make the body inhospitable for weaker infections. Chamomile tea can help with muscle spasms on two different fronts. One is due to the sedative qualities that come with the tea. Drinking a cup of chamomile can help relax the body and relieve muscles spasms. As we noted earlier, chamomile tea also contains anodyne which acts as a muscle relaxant and works really will on muscle cramps in the stomach area. For this reason, chamomile tea is often recommended to women suffering from cramping caused by premenstrual syndrome (PMS). For chest colds, sore throats, gum inflammation, and stomach ulcers, it’s chamomile’s anti-inflammatory and antibacterial properties that come into play. These properties can help calm any inflammation and clean out the bacteria causing the issues. For skin-based issues, once again, the antibacterial and anti-inflammatory properties, help as they can reduce the inflammation of acne and eczema. They can also help get rid of the bacteria that causes these types of skin issues. In treating skin issues, chamomile tea should be used directly on the skin as opposed to drinking it. This can be done by rubbing the tea into the affected area or directly applying chamomile tea bags to those areas. Now that you know what chamomile tea can do for you and your health, here’s how to make chamomile tea. Making chamomile tea can be easy. The simplest solution is to buy chamomile tea bags from the grocery store and make a cup of tea like you would any other tea. But if you are looking for a more potent version of chamomile, here is a recipe that you can use. Using a kettle, bring the water to a boil. Once it is bubbling, remove the kettle from the heat source and pour the water into a tea pot. Measure out two tablespoons of dried chamomile. Make sure it’s packed hard into the spoon. Mix the dried chamomile blossoms into the tea pot and allow it to steep for approximately five minutes. Place a strainer over the cup or mug and pour the tea into the mug and enjoy. Note, for weaker tea, don’t allow the tea to steep as long or use less chamomile flowers. Besides drinking chamomile tea, there are several ways to use the tea for various health and skin issues. The antibacterial and anti-inflammatory properties of chamomile tea can help treat burns and scrapes. Simply brew a strong cup of chamomile tea, using two or three times the bags or flowers you normally would. Once the tea has cooled, pour it directly on the wound and then wrap it with a clean cloth or bandage. This may also work for sunburns. Soak two tea bags in warm water for five minutes. Then place them on the dark circles under your eyes to help lighten or even get rid of them. This works best if the tea bags are left on the circles overnight. Chamomile tea can help lighten the skin of your face. Start by brewing two chamomile tea bags or a particularly strong pot of chamomile tea. Once it gets to the point where it is steaming, place your face over the steam but not so close that you get burned. Allow your skin to absorb the steam (a towel can be used to stream it more to the face). The steam method that we mentioned above can also be beneficial when fighting acne as the steam can open and enter the pores of the skin. This allows chamomile tea’s antibacterial effects help clean out any acne-causing bacteria. Some mild conjunctivitis and eye strain can be relieved by using a very mild chamomile mixture. Using a very weak warm or cold tea, place a few drops into the eye using an eye dropper. Also, the antibacterial properties may be able to get rid of conjunctivitis. Drinking a few cups of chamomile tea can also help reduce swelling and pain, relax muscles, reduce blood sugar levels in diabetics, and ease muscle cramping and digestion issues in those suffering from irritable bowel syndrome (IBS). When you are using chamomile tea, it is important to know about the possible chamomile tea side effects that may affect you when using the tea for medicinal purposes. If you have an allergic reaction to chamomile tea, cease using it immediately. Pregnant women should also consider not using chamomile tea as its powerful anti-inflammatory properties may cause issues with the pregnancy including possible miscarriage. Chamomile tea should also be avoided before any surgery as well. If you are taking any blood thinning medications, it can make clotting difficult. Is chamomile tea good for you? Yes, chamomile tea may be able to help you with everything from eye strain to preventing cancer. It is a relatively easy tea to acquire, and easy to brew and use. Be sure to pay attention to the side effects mentioned above while using chamomile tea. If none present themselves, the health benefits are well worth a cup or two a day. “Chamomile Tea as a Soothing Sleep Aid,” Chamomile Tea; http://www.chamomiletea.org/sleep-aid/, last accessed September 7, 2017. Deckard, A., “13 Benefits of Chamomile Tea,” Healthy Focus, February 2, 2016; https://healthyfocus.org/13-benefits-of-chamomile-tea/, last accessed September 7, 2017. “Chamomile Tea for Anxiety Relief,” Chamomile Tea; http://www.chamomiletea.org/anxiety/, last accessed September 7, 2017. “Chamomile Tea for Digestive Relief,” Chamomile Tea; http://www.chamomiletea.org/digestion/, last accessed September 7, 2017. “Chamomile Benefits,” Herbs with Rosa Lee; http://www.herbalremediesadvice.org/chamomile-benefits.html, last accessed September 7, 2017. “Using Chamomile to Treat Upset Stomach,” HowStuffWorks; http://health.howstuffworks.com/wellness/natural-medicine/herbal-remedies/using-chamomile-to-treat-upset-stomach.htm, last accessed September 7, 2017. Shukla, S., and Gupta, S., “Apigenin: A Promising Molecule for Cancer Prevention,” Pharmaceutical Research, June, 2010; 27(6): 962-978. DOI: 10.1007/s11095-010-0089-7, last accessed September 7, 2017. “How Drinking Chamomile Tea Can Help Fight Cancer,” The Natural Penguin; http://thenaturalpenguin.com/how-drinking-chamomile-tea-can-help-fight-cancer/, last accessed September 7, 2017. Gupta, S., et al., “Chamomile: A herbal medicine of the past with bright future,” Molecular Medicine Reports, November 1, 2010; 3(6): 895-901. DOI: 10.3892/mmr.2010.377, last accessed September 7, 2017. Woodfield, J., “Camomile tea could improve blood glucose control in type 2 diabetes,” Diabetes, October 27, 2015;http://www.diabetes.co.uk/news/2015/oct/camomile-tea-could-improve-blood-glucose-control-in-type-2-diabetes-91406398.html, last accessed September 7, 2017. “The 7 Benefits of Drinking Chamomile Tea,” BistroMD; http://www.bistromd.com/healthy-eating/the-7-benefits-of-drinking-chamomile-tea, last accessed September 7, 2017. 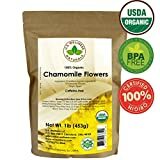 “Chamomile Tea: Trusted Benefits,” Chamomile Tea; http://www.chamomiletea.org/health-benefits/, last accessed September 7, 2017. “Chamomile Tea for Healthy Skin,” Chamomile Tea; http://www.chamomiletea.org/healthy-skin/, last accessed September 7, 2017. “German chamomile,” University of Maryland Medical Center; http://www.umm.edu/health/medical/altmed/herb/german-chamomile, last accessed September 7, 2017. “18 Amazing Benefits of Chamomile Tea for Your Health,” Natural Remedy Ideas; http://naturalremedyideas.com/chamomile-tea-benefits/, last accessed September 7, 2017. “Chamomile tea Side Effects and Risks,” Green Tea Source; https://www.greenteasource.com/chamomile/health/side-effects, last accessed September 7, 2017. This post appeared first at Doctors Health Press and appears on Natural Blaze with permission.